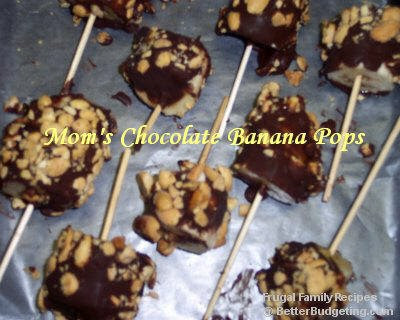 Years ago, when my mom was visiting with us, she helped the kids and I make these great frozen treats (using up our 'almost too ripe to eat' bananas). They were fun and easy to make, and delicious! She had been telling me about them for years so I'm glad we finally got a chance to make them together with the children. I hope y'all enjoy them as much as we did. This amount made enough for our family of 6, and Nana, to have plenty! Cut bananas into small pieces, insert sticks and place on baking sheets lined with waxed paper. Meanwhile, melt chocolate candy in microwave for about 2 minutes (or until melted), stopping to stir every 30 seconds. DO NOT MELT FOR MORE THAN 30 SECONDS AT A TIME! Dip banana pieces into melted chocolate and twirl to coat. Then roll each pop gently in chopped peanuts and place back on waxed paper. Place banana pops in freezer until well chilled, then transfer to a large freezer bag if needed. I wouldn't worry about how long they'll keep, they'll be eaten up before you even have time to think about it!